According to recent news accounts, shattered and shredded body parts and remains of U.S. servicemen were found in a landfill. Despite political spins, this sobering image is a telling, true-life metaphor for what those in power really think of soldiers, many of whom are but boys and girls freshly loosed from High School. THURS & FRI Calls for Prison Hunger Strikers and Leonard Peltier! Call every Thursday and Friday until the demands are met! Call for the CA Prison Hunger Strikers! Thousands of inmates in at least 13 prisons across California’s troubled prison system have been on hunger strike for almost two weeks. Many are protesting in solidarity with inmates held in Pelican Bay State Prison, California’s first super-maximum security prison, over what prisoners say are cruel and unusual conditions in "Secure Housing Units." We play an audio statement from one of the Pelican Bay prisoners and speak to three guests: Dorsey Nunn, co-founder of "All of Us or None" and executive director of Legal Services for Prisoners with Children, and one of the mediators between the prisoners on hunger strike and the California Department of Corrections; Molly Porzig, a member of the Prisoner Hunger Strike Solidarity coalition and a spokesperson for Critical Resistance; and Desiree Lozoya, the niece of an inmate participating in the Pelican Bay Hunger Strike, who visited him last weekend. Molly Porzig, a member of the Prisoner Hunger Strike Solidarity coalition and a spokesperson for Critical Resistance. Dorsey Nunn, co-founder of "All of Us or None." He is also the executive director of Legal Services for Prisoners with Children. Nunn was incarcerated from 1971 to 1982 in San Quentin Prison in California. He is one of the mediators between the prisoners on hunger strike and the California Department of Corrections. Desiree Lozoya, is the niece of an inmate participating in the Pelican Bay hunger strike. Individuals and activists plan events around the world to show support for the accused WikiLeaks whistle-blower on March 19-20. 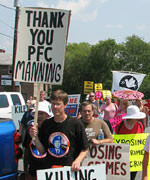 On March 19-20, 2011, activist organizations and individuals will take to the streets to protest the U.S. government's treatment of accused WikiLeaks whistle-blower Army Private First Class Bradley Manning. Manning, 23, has been held in isolation for nearly 300 days, charged with releasing classified documents, including a video that shows American troops shooting and killing 11 people, including two Reuters employees, in 2007. In the best-selling Steig Larsson trilogy, The Girl with the Dragon Tattoo, The Girl Who Played with Fire, and The Girl Who Kicked the Hornet’s Nest, the heroine, Lisbeth Salander, a hardwired, brilliant young computer genius is shot and presumed to be dead, but is actually buried alive by the antagonist. He is a prototype of the cruel, greedy, misogynistic, exploiter. She claws herself out of her premature grave and, indomitable and focused, defeats him. Finally by the end of volume three she has triumphed—using her own brains and, relying on her friends and comrades—over the entire corrupt corporate, governmental, military power structure that had been trying to oppress and suppress her, her whole life. MUMIA'S LIFE IS IN DANGER! MUMIA ABU-JAMAL faces his likely last court hearing on November 9th, 2010, at the Third Circuit Federal Court of Appeals, in Philadelphia. This hearing is about sentencing only. The only legal options to be considered at the Third Circuit's November 9 hearing are whether Mumia Abu-Jamal is to be executed or get life in prison without parole. Clearly neither of those two options is acceptable. A new caucus has been formed. The Free Leonard Peltier Caucus is working to circulate a petition for signatures to be presented to Pres. Obama at the end of his tenure asking for a presidential pardon for the longest held political prisoner, Leonard Peltier. ABU-JAMAL NEWS: Published by Journalists for Mumia... DOWNLOAD!! Click on above front page or Download HERE!! JUSTICE ON TRIAL - The Case of Mumia Abu-Jamal from bignoisetactical on Vimeo. On September 8, Gregory Koger was sentenced to 300 days in jail for videotaping a brief political statement at a public event in Skokie, IL. When Gregory was asked to stop, he put down his video camera. Trespass charges were brought because he started filming with his iPhone. But videotaping is not a crime! Bradley Manning is the U.S. soldier now in a US military prison in Kuwait who has been arrested and charged with two violations for releasing classified information (the Wikileaks "Collateral Murder" video) and facing 54 years in prison. He is being held in isolation from the outside world - with no contact with his civilian attorneys working to defend him. If the allegations are true, Bradley Manning is a hero for bringing to light the realities of the crimes being committed in the U.S. occupation. We call for his immediate release and that his attorneys be allowed to talk to him. MOVE message: CALL to Protect political prisoner Chuck Africa! ONA MOVE! I’M SENDING THIS EMAIL OUT TO INFORM YOU OF A VERY SERIOUS SITUATION HAPPENING WITH OUR BROTHER, CHUCK AFRICA. THIS FALLS ON THE HEELS OF US EXPOSING PHILADELPHIA INQUIRER COLUMNIST, MONICA YANT KINNEY AND ALL OF THE INFORMATION WE WERE ABLE TO PUT OUT DURING MEDIA INTERVIEWS MARKING TWENTY-FIVE YEARS SINCE THE BOMBING.